Investing in education is a serious decision. When you explore training options that may increase your salary level and employment potential you are, in effect, investing in yourself. At OXARC, we encourage a student population of responsible adults because we know that they are the best learners. When personal success is the end product of the training process, it virtually guarantees the success of any academic program. At OXARC, we concentrate on job-specific training. 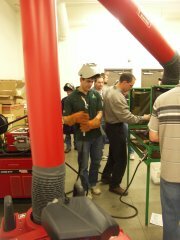 Our welder training program is based on industry needs. As industry makes changes and new technologies are developed, the welder training program at OXARC will be updated to keep pace with these changes. Our goal is to provide quality training in key skill areas in the most practical, justifiable timeframe. 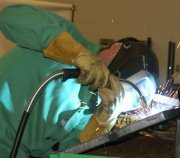 We will concentrate on making your welding experience meaningful and enjoyable. Our welding courses are for the self-motivated adult who recognizes the need to keep ahead of the job market. By keeping up with the welding standards in the industry, you will experience career satisfaction and enjoy the economic and social rewards of a position ideally suited to your interests and abilities. OXARC offers all training sessions in a stand-up lecture basis with an emphasis on hands-on experience learning. This methodology ensures that students receive the technical industry terminology and standards while learning hands-on skills. Beginner/Entry-Level: (5 Weeks/160 Hours) This course will teach a general concept of the welding fundamentals, principles and welding techniques required for the welding process chosen by the student. All welding will be on mild steel. Intermediate: (5 Weeks/160 Hours) Welders entering this course should have experience at welding and good fundamental knowledge of the welding process for which they are training. This course is geared towards the welder doing complete full penetration on plate or pipe for a given process. All welding will be on mild steel. Upon completion of the course, welders will be given the opportunity to become certified to one of the industry standards. Advanced: (5 Weeks/160 Hours) This course is designed for the experienced welder. Welders taking this course should have extensive experience at welding. This course will be tailor-made for each student. 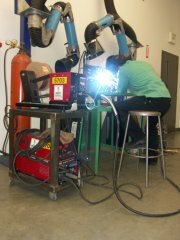 The curriculum is designed around the welder obtaining certification to one of the industry standards. Advanced II: (5 Weeks/160 Hours) Welders taking this course should have extensive welding experience and have, or have had certification in one or more of the following processes: SMAW, FCAW, GMAW, GTAW. Prerequisite: 5wks (160hrs) Advanced Welding. We believe that all students should have the opportunity to develop the fundamental and technical skills that will enable them to secure and retain productive and rewarding career positions in the welding industry. OXARC is committed to providing welding courses that deliver the maximum amount of training in the minimum amount of time, with safety and quality as our goal. The dedication to the overall success of each student forces OXARC to continually strive to maintain its reputation of delivering the highest quality training possible through a combination of qualified, experienced staff; well-organized curricula and contemporary equipment, which reflect current industry standards. 3) Provide students with the most skilled and experienced staff available who are devoted to the personal and career development of every student. "The instructors did an A+ job in my opinion." "Thanks for offering a great training course!" "Thank you guys for everything. My family and I greatly appreciate it." "All the instructors were excellent." All of the instructors at OXARC's School of Welding have vast experience in the trade, as well as certifying and training welders, or potential welders for the industry.